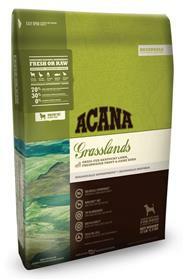 Formulated to reflect our rich agricultural heritage, ACANA GRASSLANDS is a unique, grain-free formula made with fresh regional ingredients to promote peak conditioning in dogs of all breeds and life-stages. High-protein and low-carbohydrate to match the natural diet of dogs, ACANA GRASSLANDS is made with ranch-raised lamb plus fresh eggs and northern walleye and northern pike, —wild-caught fish that arrive at our door FRESH EACH DAY so they’re never frozen and contain no preservatives. Deboned lamb, lamb meal, duck meal, whiteﬁsh meal*, whole peas, red lentils, ﬁeld beans, whole potato, deboned duck, whole eggs, deboned walleye, duck fat, herring oil, lamb liver, herring meal, sun-cured alfalfa, pea ﬁbre, whole apples, whole pears, sweet potato, pumpkin, butternut squash, parsnips, carrots, spinach, cranberries, blueberries, kelp, chicory root, juniper berries, angelica root, marigold ﬂowers, sweet fennel, peppermint leaf, lavender, rosemary. Acana is the BEST quality kibble there is. I vary between the Pacifica and Grasslands. It's expensive, but worth every cent! Acana dog food is the best quality food I have ever fed my dogs. I vary between the Salmon and Lamb. I esp. like the fact that the protein/fat ratios are not excessively high. I've been feeding this to my dogs for the past month and really like the way my doggies have taken to it. Princess has put on a good weight and her coat is now nice and shinny. Bailey LOVES this and gobbles it down as fast as he can. I'm completley satisfied with the incredible low price I found on Natural K9 Supplies and the really great customer service.